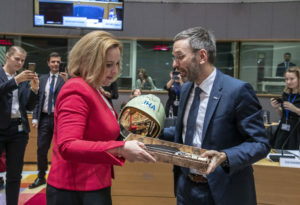 The program assumed by the MoIA for the timeframe of January 1st – June 30th, 2019 was presented in Brussels by the Minister of Internal Affairs, Carmen Dan, and includes among its priorities the strengthening of the Union’s internal security, the management of external borders, migration and the fight against online radicalization. The JHA Council meeting, which took place on 6th of December 2018, in Brussels, is the last held under the aegis of the Austrian Presidency, and from the 1st of January 2019 until 30th of June 2019, the Presidency of the of the European Union Council will be exercised by Romania. Among the priorities for the internal affairs component of the Romanian Presidency of the Council there is the continuation of important work files in progress, such as migration, the management of external borders and the strengthening of the internal security of the European Union. A very important aspect in the field of migration and management of external borders is the strengthening of the role of Frontex, which means increasing the human and logistical capabilities that Member States provide to this European agency. Other files that the Romanian Ministry of Internal Affairs will treat as priorities during the Presidency of the EU Council are those related to fighting online terrorist content and developing at EU level the concept of community policing. With regard to countering terrorist radicalization in the on-line environment, important discussions are ongoing, including with major corporations that manage social networks and solutions are being sought for an European regulation by means of which states can block this content when it occurs. The concept of community policing is an initiative of the Ministry of Internal Affairs, aimed at facilitating the relationship between law enforcement agencies and the expat communities within the Member States of the European Union. Romania has a notable expertise in this field, with Romanian police officers carrying out operational missions in countries such as Italy, Spain, France or Bulgaria. The missions were concluded with very good results in the area of preventing and combating crime involving Romanian citizens living in the above-mentioned countries, as perpetrators or victims. The next JHA Council meeting, in an informal format, will be held in Bucharest on February 6-8, 2019. 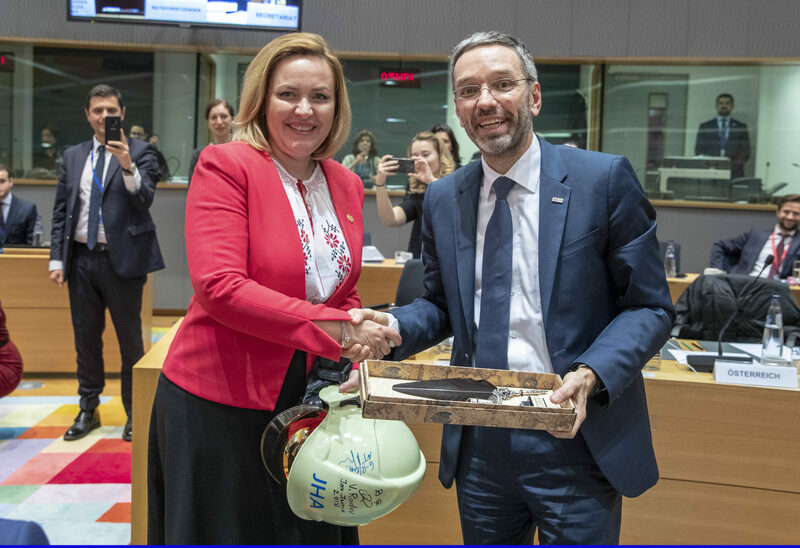 In the first six months of 2019, Romania will host dozens of high-level events, including the EU-US Ministerial Reunion on Justice and Home Affairs. PHOTO Carmen DAN, Romanian Minister for Internal Affairs; Herbert KICKL, Austrian Federal Minister for the Interior. MoIA will chair, during the Romanian Presidency of the Council of the European Union mandate, 20 working groups, provide expertise for 10 working groups under the responsibility of other ministries and will participate in three other working groups at the level of the European gencies, a total of 33 working groups. At the same time, during Romania’s exercising of the Presidency of the Council of the European Union, MoIA’s staff will manage, in Brussels, the topics to be debated in over 200 working group meetings. In Romania, MoIA will organize, in the first semester of 2019, 20 informal events (2 ministerial meetings, 9 senior officials meetings – directors and heads of agencies – and 9 expert meetings). 327 MoIA’s employees will be involved during the Romanian Presidency of the Council of the European Union as presidents/vice-presidents/reserves for the working groups which MoIA will manage and also as file managers and experts.